Sir Winston Churchill is rightly regarded as one of the premier statesmen of the 20th century. His unflinching leadership during the second world war inspired his country during dark times and gained him the admiration of people around the world. 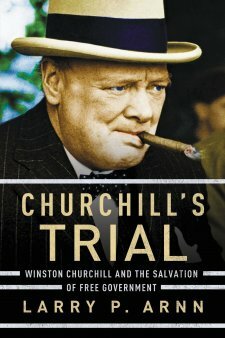 The book Churchill's Trial takes a look at the career and driving forces behind this leader, from World War II and beyond. The book is divided into three sections which reflect the three major forces that Churchill faced during his career: the war years, the struggle to maintain the British empire, and the rise of socialist policies following the war. Churchill's work during the war is well documented, but I was more interested in reading about his attitudes following the war. Apparently, he believed that the countries in the British Empire would want to stay part of the empire "by principle and sentiment." Surprisingly, countries in the British empire contributed nearly a third of the soldiers and suffered nearly half the casualties of British forces in World War II. Certainly, the point can be made that Britain might not have been on the winning side in the war without the assistance of so many soldiers from the empire. At the same time, Churchill didn't believe that these countries had the ability to govern themselves. While this put him at odds with the United States, he held firm in his belief that Britain could best govern these countries, and that the people were incapable of doing it themselves. He was also of the viewpoint that maintaining order was the most important thing ("harsh laws are sometimes better than no laws at all"). While his viewpoints might seem at odds with modern ideas, the author does believe that British influence had a great impact on the establishment of modern democratic India and that, in the long run, the Indian people as a whole are better off than they might otherwise have been. During Churchill's lifetime, the Labour party was formed and governed Britain. He fought their ideals of nationalization for the rest of his life, even though he was to lose this battle. Churchill believed that Capitalism unequally shared the wealth, but that Socialism was more than happy to spread misery to everyone. He was also concerned that when problems arose in a Socialist society, that leaders would resort to a "Gestapo" to keep order. His opposition to Socialism was so staunch that he refused to work with any Socialists in cabinets or coalitions, except when the stresses of World War II required him to set his principles aside. He was gracious in defeat in 1945 when his party lost to the Labour party, but he was concerned that the British nation was changing in character (for the worse, of course!) due to the hardships caused by the war. At the same time that he opposed Socialism, Churchill did see the need for social and economic reforms, and even supported some of these reforms. However he disliked the thought of big government and feared that it would not be able to better serve the needs of the people than the systems of rule that had come before. The book ends with some of Churchill's writings and speeches. Overall, the book is an interesting look at a well-known leader that helped to shape modern Britain.